We’ve had the good fortune to test drive and report on many Lexus models over the years including the popular RX 350 and NX 300h crossovers. 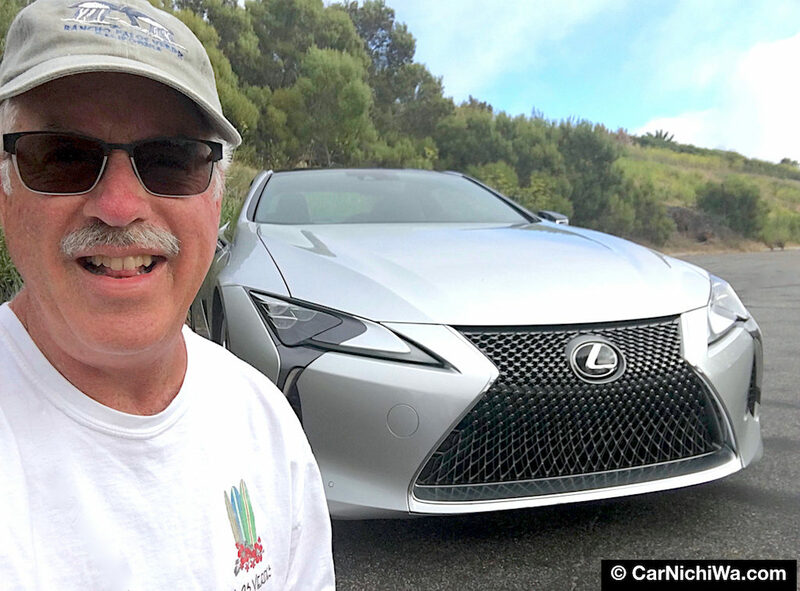 While we didn’t have a chance to drive the LFA supercar, we’re very lucky to have just completed a one-week test-drive of the all-new 2018 LC 500 grand touring performance coupe. 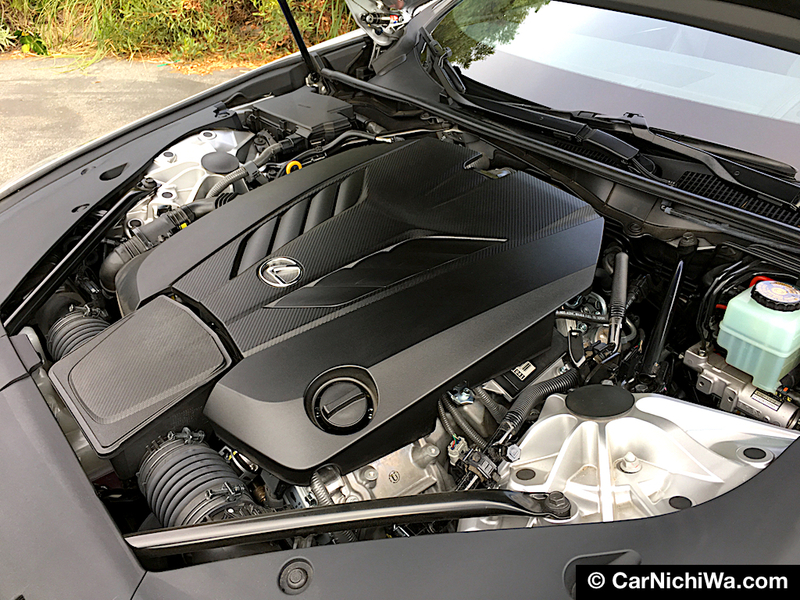 We asked Lexus for the LC 500 with its high-output V8 engine and new 10-speed direct-shift transmission. 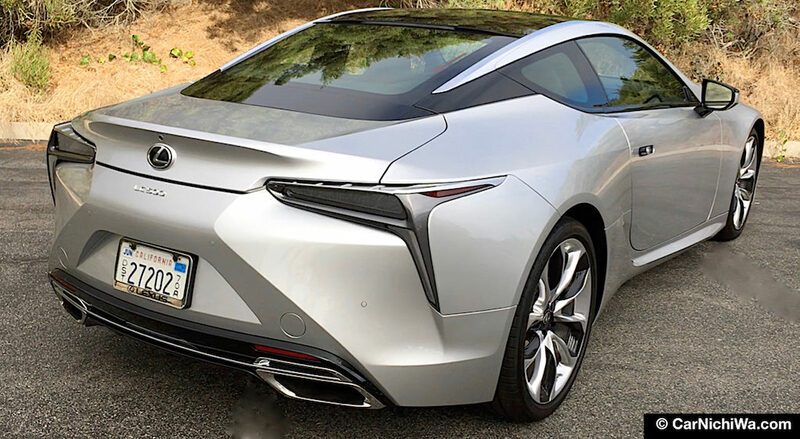 Also available is the LC 500h that teams a V6 engine with a Multi Stage Hybrid system and two electric motors via the Lexus Hybrid Synergy Drive. 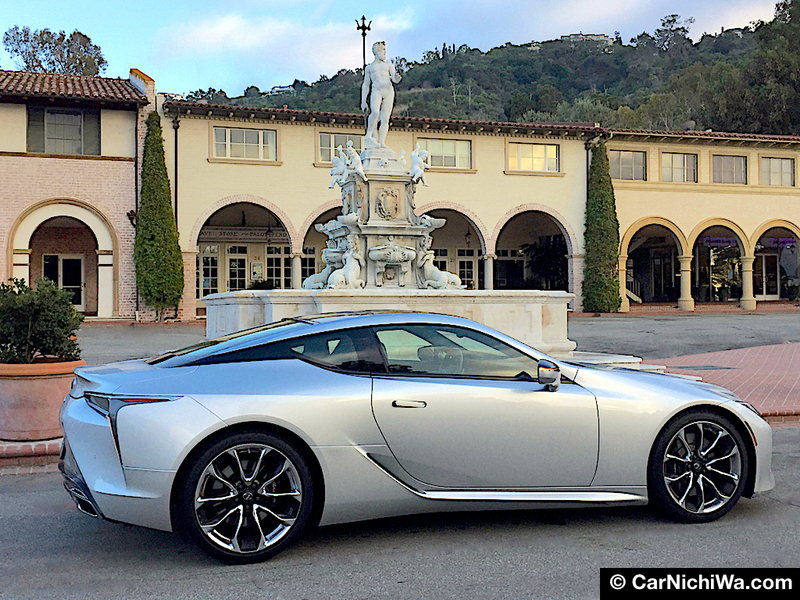 Our gorgeous LC 500 test car looks right at home parked next to the King Neptune statue in historic Malaga Cove Plaza in Palos Verdes Estates, a suburb of Los Angeles County. The LC 500 rides on the new GA-L platform that Lexus plans to employ on future front-engine rear-drive models. Up front is a new high-mounted aluminum-intensive multi-link suspension with a double-joint, upper-lower four-link design. It works together with a multi-link rear suspension to deliver outstanding ride and handling. Dynamic styling influenced by the Lexus LF-LC concept car features a wide, low and aggressive stance. Our tester was fitted with optional 21-inch forged-alloy wheels shod with Bridgestone Potenza S001 run-flat tires sized 245/40RF21 in front and 275/35RF21 in the rear. The ducts in the rear fenders are functional, doing their part to assist airflow management. Incredible stopping power is generated by 15.7-inch six-piston front and 14.1-inch four-piston rear brakes with aluminum calipers and high-friction pads. 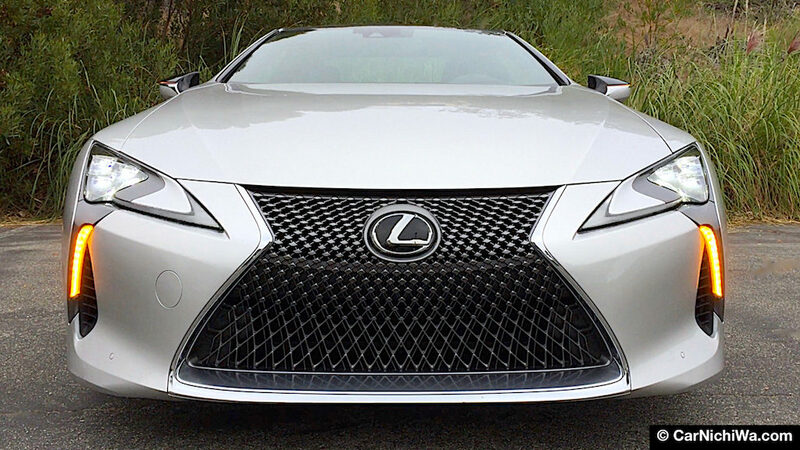 The LC 500 is dressed with a mesh-style Lexus signature spindle grille flanked by ultra-compact LED triple-projector headlights and L-shaped “arrowhead” LED daytime running lights. We activated the four-way flashers to capture the amber LED turn signals in our above photo. The rear fascia design reflects the spindle shape at the front. Meanwhile, the floating-style roof on our test car featured a big glass panel that lets lots of natural light into the cabin. An optional carbon-fiber roof helps to save weight. Major body panels, including the hood, front fenders and door skins are made of aluminum; the inner panels of the doors and trunk are made of CFRP sheet-molding compound while the rear fenders are steel. The LC 500 is built with incredible attention to detail. For example, as we show in our video, flush-style door handles pop open and retract automatically. The underbody is nearly smooth and even the muffler shape is aerodynamically efficient. An available Performance Package (not on our test car) adds an Active Rear Spoiler and Active Rear Steering. Under the hood, our LC 500 was equipped with the 5.0-liter naturally aspirated high-output 32-valve V8 with direct fuel injection. It puts out a thrilling 471 horsepower (351 kW) at 7,100 rpm and a stout 398 lb.-ft. (540 Nm) of torque at 4,800 rpm. Lexus quotes zero to 60 mph in less than 4.5 seconds and an electronically limited top track speed of 168 mph (270 km/h). While we didn’t have an opportunity for track testing, our LC 500 was incredibly quick and remarkably fun to drive. The engine is teamed with a new 10-speed sport direct-shift automatic transmission with a by-wire shifter on the floor console and magnesium paddle shifters on the steering wheel. As we demonstrate in our test-drive video, excellent response under full throttle is available by simply selecting the “D” shift position, flooring the accelerator (on a lightly travelled highway), and letting the car shift by itself. 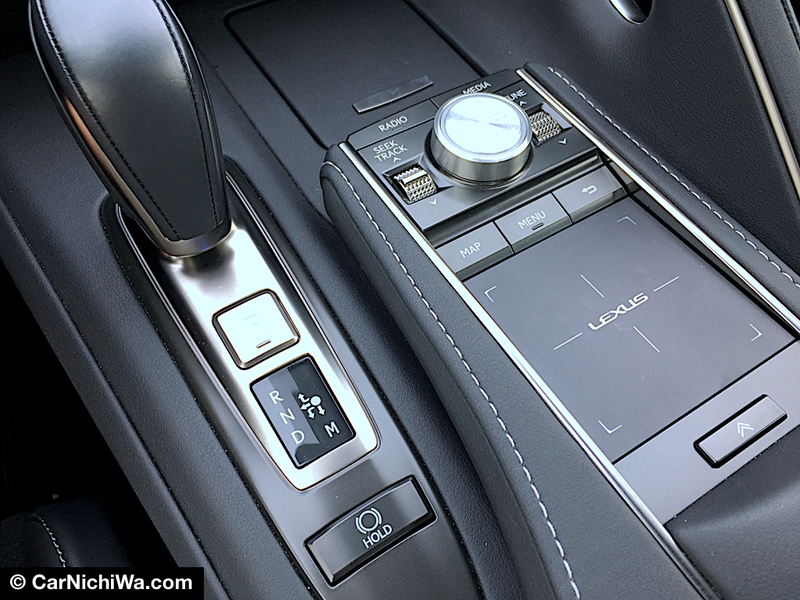 Lexus says it uses a new control system that reads the driver’s intentions from the accelerator, brake and vehicle gravitational acceleration to allow for optimal gear selection. Using the Drive Mode Select knob mounted on the instrument panel (above), we quickly switched between Comfort, Eco, Sport and Sport S+ modes. During our week in the car, we sampled each of the modes on a variety of different roads and elevations. “Comfort” was suitable for all-around driving while Sport S+ delivered sweeter music to our ears from the Active Exhaust. In addition to controlling the engine and transmission for maximum performance, Sport S+ also fully opens the baffles in the Active Exhaust system under hard throttle. We captured the delightful exhaust sound inside the cabin with the driver’s window down during our Test Drive video. 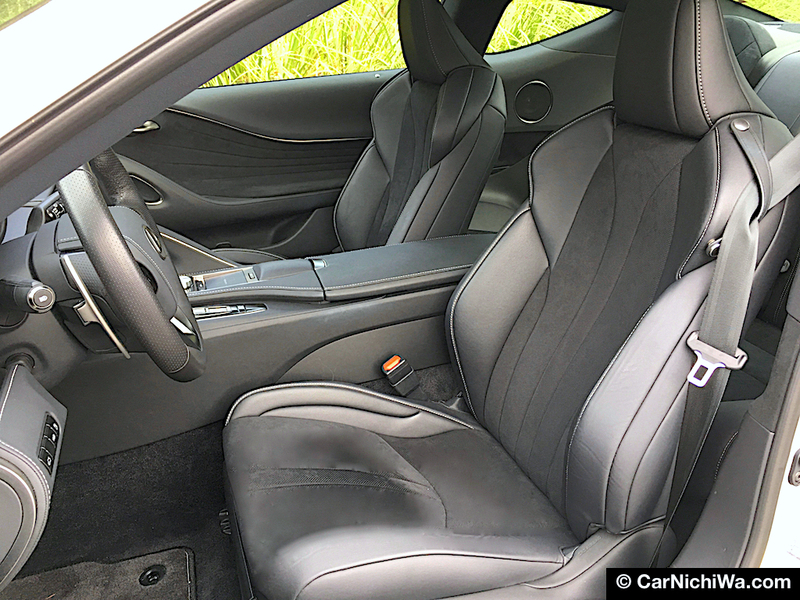 The deeply bolstered power front sport seats on our tester were extremely comfortable and supportive. Trimmed with grippy Alcantara® inserts, they kept us firmly in place during spirited cornering. Lexus says these seats use a construction method where the upholstery and foam are integrated for greater comfort. The 2+2 cabin includes two recessed rear bucket-style seats for occasional use. It’s nice to have the ability to bring friends along, yet we used the seats during our test to hold items like our camera bag and gear. Every facet of the interior is exquisitely designed and engineered. With the low instrument panel position, low hoodline and narrow A-pillars, we enjoyed a great view of the road. 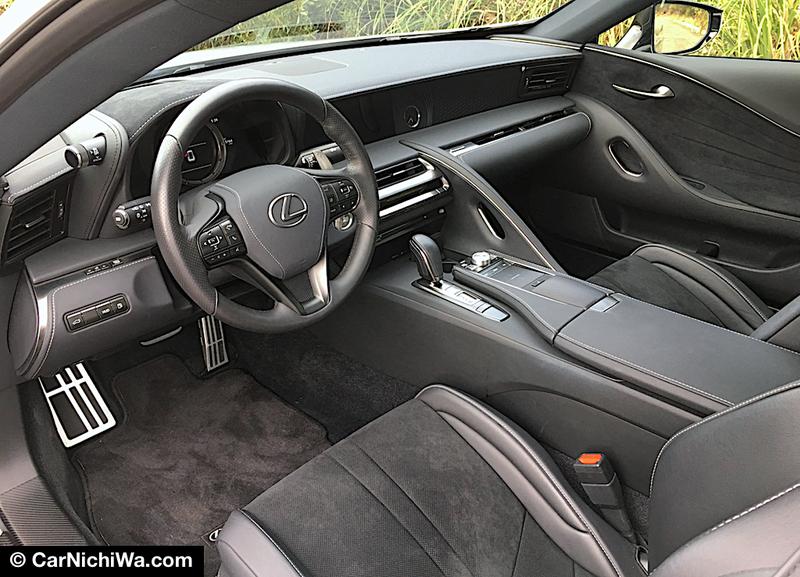 Lexus says that features like the placement of the pedals and switches, angling of the steering wheel and snug fit of the seats have undergone rigorous testing during the development process. 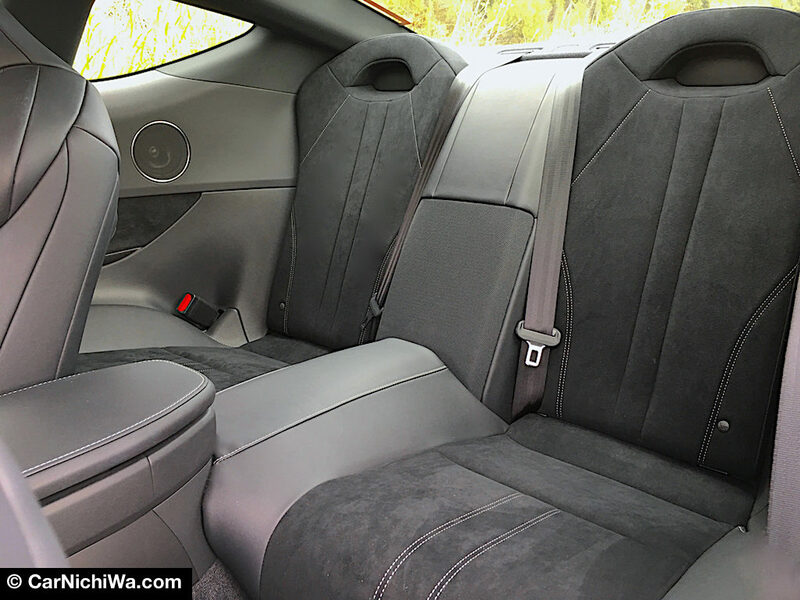 Notice the built-in grab handles for the front seat passenger. The small-diameter, thick-rimmed power tilt-and-telescopic three-spoke steering wheel puts the driver in command of the big coupe. 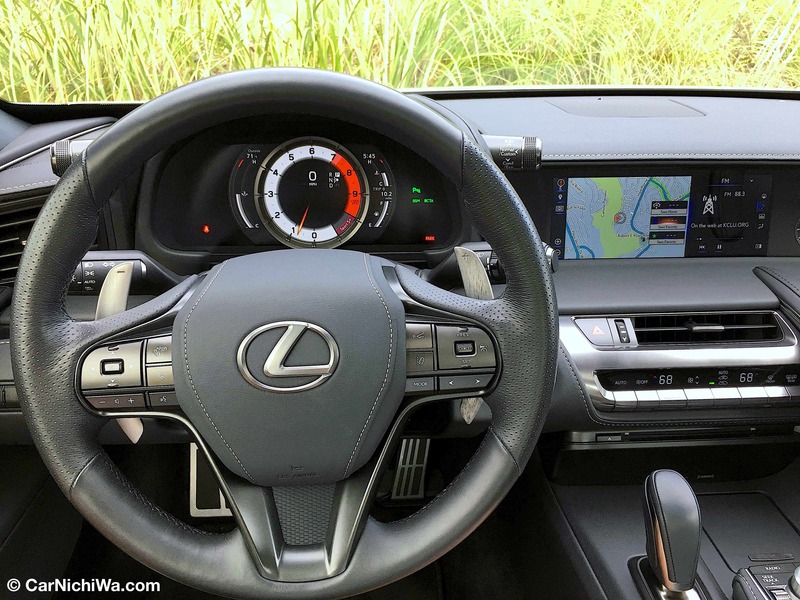 Behind the wheel is the latest version of the Thin Film Transistor (TFT) display employing advanced technology that debuted in the Lexus LFA. Steering-wheel-mounted controls are well positioned and easy to use. We really liked the 8-inch display’s moving central ring that slides to the right to reveal more information (watch it in action during our Walkaround video). 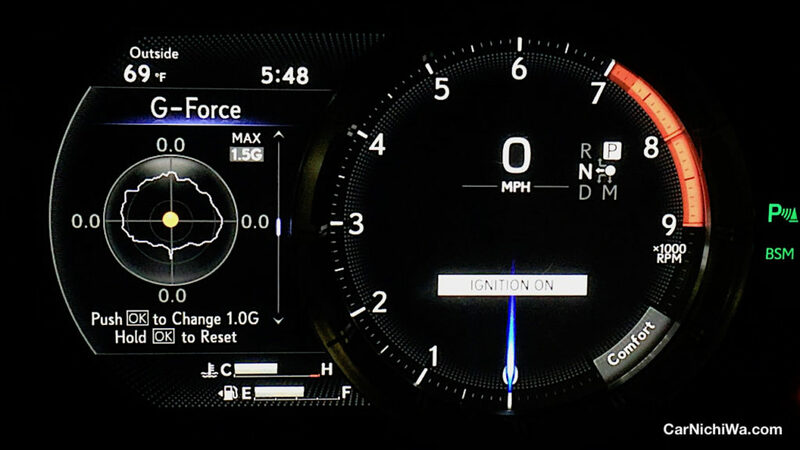 The driver can select a wide array of information including a G-Force meter (above) and customize the operation of many features. Our tester’s big 10.3-inch center display was also easy to use thanks to a Remote Touch Interface pad on the center console that allows tapping, swiping and pinching, like a smartphone. Menu pop-ups on the bottom of the screen allow quick access to Audio, Navigation, Phone, Apps and more. The standard Lexus Premium Audio system sounded great with 12 speakers and digital signal processing. SiriusXM® satellite radio is also standard and so is the Lexus Inform App Suite 2.0 with new native and available third-party apps. With the split-screen design, we could display a navigation map on the left and a radio station on the right. It also shows the back-up camera’s display with its dynamic grid lines that turn with steering input plus alerts for our tester’s optional Intuitive Parking Assist. We also used the voice command button on the steering wheel to control navigation along with many other features and functions. The Trip History display (above left) shows our mpg for the previous 15 minutes of driving. In this case, we were taking photos at low speeds and momentarily scored 40 mpg. 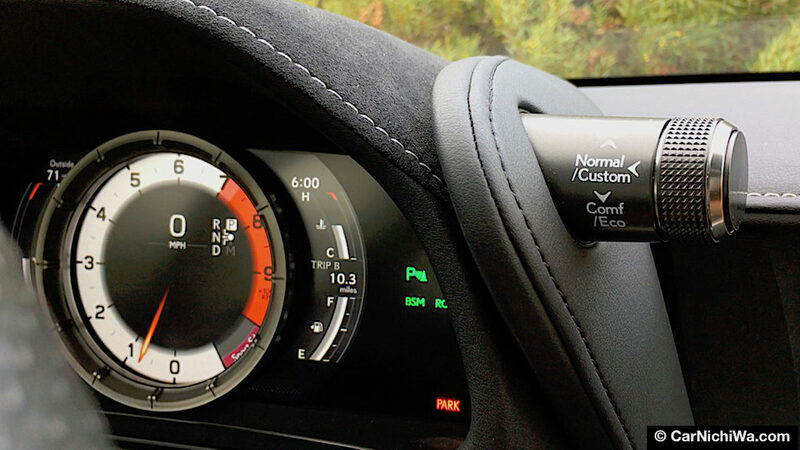 The LC 500’s EPA estimated fuel economy is 16 city, 26 highway and 19 combined. Running on premium unleaded, using Sport S+ mode while making our videos, plus extended periods of idling and applying a heavy foot to the accelerator during our weeklong test-drive resulted in 14 mpg. 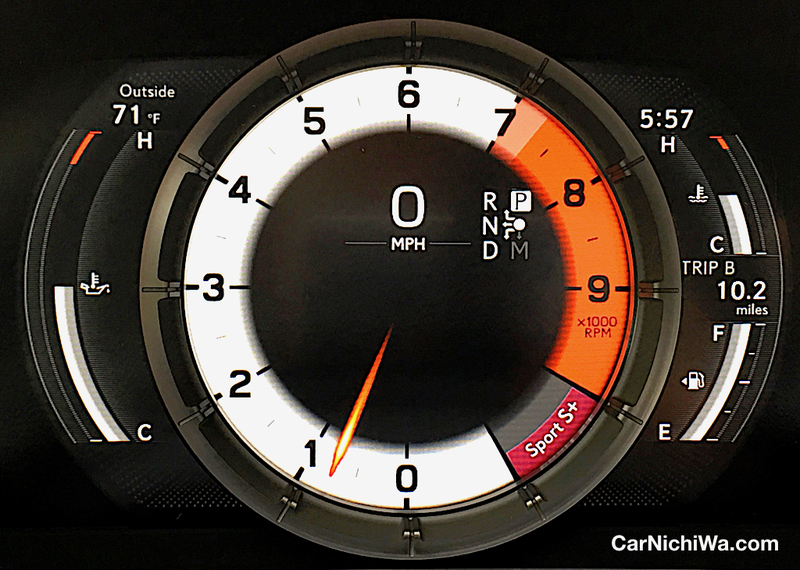 If fuel economy was a buying motivation, we might shift our focus to the LC 500h hybrid that’s rated at 26/35/30. The beautifully crafted LC 500 is a joy to behold from every angle. Lexus says that a dedicated LC production line at the Motomachi Plant in Japan adopts Monozukuri (manufacturing) that leverages masterful craftsmanship and advanced production engineering. The line features the latest systems for quality assurance including the use of tablets to check each team member’s work process. 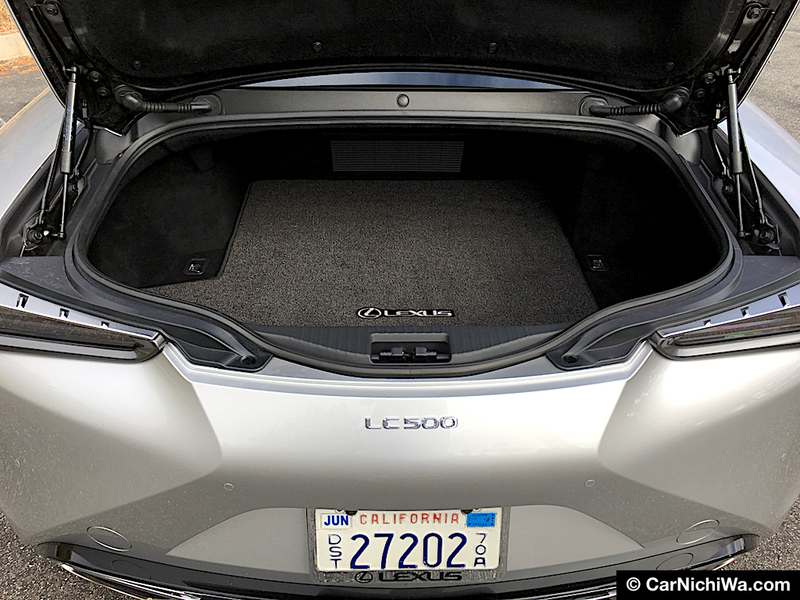 Under the easy-to-open decklid is a compact cargo compartment offering 5.4 cubic feet of space to store gear, soft luggage, groceries and keep small valuables out of sight. 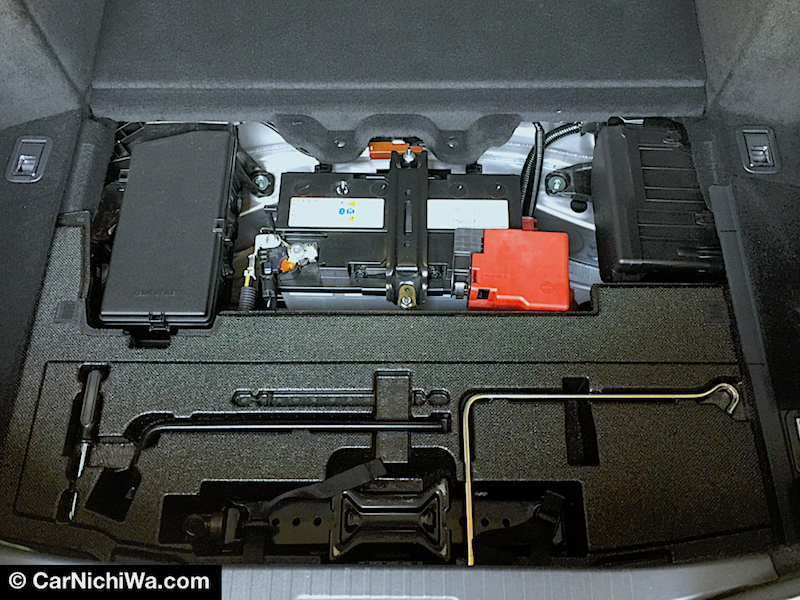 Removing a panel on the trunk floor revealed the coupe’s 12-volt battery mounted here to assist with the car’s 54:46 vehicle weight distribution. The jack and tools are also located here, while additional weight is saved by eliminating the spare tire and using high-tech run-flats. LC 500’s standard Lexus Safety System+ includes a Pre-Collision System with Pedestrian Detection, All-Speed Dynamic Radar Cruise Control, Intelligent High Beam, Lane Keep Assist and Lane Departure Alert with steering assist. With a base price of $92,000, our LC 500 added the Sport Package with glass roof, a Convenience Package with Blind Spot Monitor and Intuitive Parking Assist, 21-inch wheels, Torsen® Limited Slip and a color Heads-Up Display for a bottom line of $99,335 including destination. Prices for the LC 500h hybrid start at $96,510. 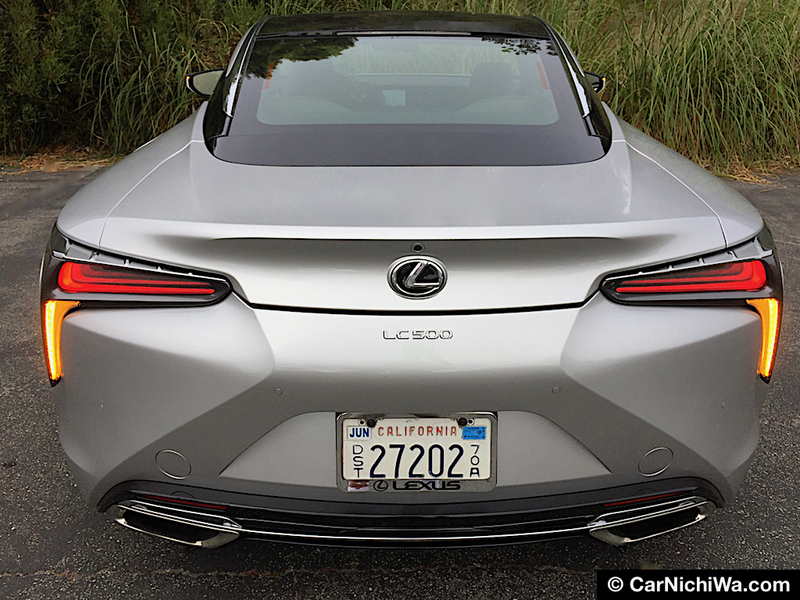 The most difficult part of our LC 500 test was returning the car to Lexus. 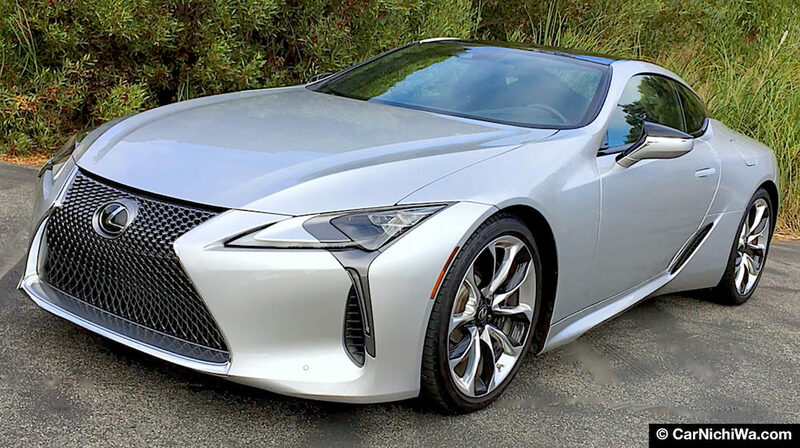 If we were in the market for a performance luxury coupe in this price range, the new Lexus LC 500 would be at the top of our list. LC 500 pre-production prototype press fleet vehicle provided by the Lexus Division of Toyota Motor Sales, U.S.A., Inc. Prices and vehicle information applies to U.S. production models at the time of publication, not including taxes, license, etc. All product information including prices, features and specifications is subject to change without notice.